Theodore Roosevelt is known as one of the greatest American Presidents this country has known. He was primarily known as a great conservationist and started the National Park System. He did renovations to the White House and imprinted a “can-do” attitude which helped the population face the challenges of the new 20th Century. Among all these things, Theodore Roosevelt was also an active Mason who exemplified the spirit and brotherhood of Masonry while serving as President. He believed in Masonry until his death. I did some research and thought I would share some of these facts with you in this Blog. Brother Theodore Roosevelt was initiated: January 2, 1901, Matinecock Lodge No. 806, Oyster Bay, New York. Brother and President Roosevelt visited the Grand Lodge of Pennsylvania (in its present home, the Masonic Temple at One North Broad Street) on November 5, 1902, for the Celebration of the Sesqui-Centennial of Brother George Washington's Initiation into Freemasonry. Governor of New York, 1899-1901. Brother and President Roosevelt issued an Executive Order, dated, October 17, 1901 changing the name of the "Executive Mansion" to the "White House". Theodore Roosevelt, said in 1902, "One of the things that attracted me so greatly to Masonry . . . was that it really did live up to what we, as a government, are pledged to -- of treating each man on his merits as a Man"
The following is an excerpt from Theodore Roosevelt’s obituary which was published upon his death. His obituary further validated his love and commitment to Masonry. 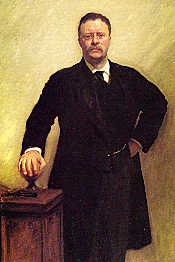 While a member of Matinecock Lodge, Theodore Roosevelt resided and raised his family in a beautiful home there which he called Sagamore Hill. I recommend that any Mason take the tour of this beautiful home which is brimming with historical significance. Today this residence is run by the National Park Service which gives public tours. If I sound biased about Theodore Roosevelt, it is with good cause as I am proud to say that in 2001 I was a recipient of the Theodore Roosevelt Award and I personally was given a tour of his home. It was a fascinating and unforgettable experience for me which I will never forget. For a more in depth study of Roosevelt’s Lodge service, you can read the web page taken from the web site for Matinecock Lodge which is located in Roosevelt’s hometown of Oyster Bay, New York. I put this web address here for your convenience. I know this is a 9 year old post, but I need to make a comment nine years late. Recently I went to a public market in Rochester NY. I got a book for free from an old man, and it is the Supplementary Messages and Speeches of Teddy Roosevelt. However, after some looking into the book, it references pages that do not exist. It starts on page 740, and it has different pictures in the beginning of Teddy than the other copies I've found on the internet do. Also, when flipping through, I found a little card, super old and stuff, and it is addressed to "Mr.-------" The card is maybe four inches long and in small print has detailed and older language about becoming a Mason. there are three paragraphs, and the middle one is the biggest. The cards addressed to a person who is joining masonry, and it states "Masonry consists of a course of ancient hieroglyphic moral instruction, taught agreeably to ancient usages by types, emblems, and allegorical figures." and a bunch more sentences like that and what it includes. I did some research, including reading your blog post, and Theodore was a Mason himself. I'm not sure what this means, probably that the person who owned this book, printed in 1906, was interested in that sort of thing. I know you will probably never see this, but I am very curious and want to know if I've stumbled upon something really cool. Thanks.